The caracal /ˈkærəkæl/ (Caracal caracal), an aa kent as the desert lynx, is a wild cat that is widely distributit athort Africae, central Asie an soothwast Asie intae Indie. In 2002 the IUCN leetit the caracal as Least Concern as it is widespread an relatively common. The felid is considered threatened in north Africae, an rare in the central Asie republics an Indie. 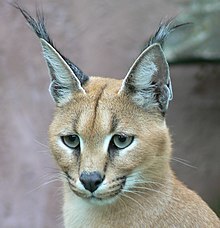 The German naituralist Johann Christian Daniel von Schreber first describit Felis caracal in 1776 frae a specimen collectit frae Table Muntain, Sooth Africae, which is considered the type locality o the species. The generic name Caracal wis first uised bi the Breetish naituralist John Edward Gray in 1843 on the basis o a type specimen collectit near the Cape o Guid Hope. The caracal haes been classifee'd variously wi Lynx an Felis in the past, but molecular evidence supports a monophyletic genus that is closely allied wi the African gowden cat an serval. ↑ Wozencraft, W. C. (2005). "Order Carnivora". In Wilson, D. E.; Reeder, D. M. Mammal Species of the World (3rd ed.). Johns Hopkins University Press. p. 533. ISBN 978-0-8018-8221-0. OCLC 62265494.